An angry commuter stopped an MTA bus in the middle of a busy downtown street in Manhattan Tuesday night, wreaking damage on it as he berated the driver for refusing to open the doors for him as he chased it down for more than 20 blocks, video shows. Cellphone video recorded by a witness at East Houston and Chrystie streets just before midnight on Tuesday showed a man blocking an articulated M15 bus from moving as he ranted at the driver. "Go ahead, run me over, just like you ran past every bus stop as I bang on your f--ing door, you piece of s--t," the man shouted as he pounded the windshield. The man proceeded to break off the driver's side mirror, video shows, then screamed, "Let everybody off the bus! Let everybody off the bus now, because you're not going anywhere." A bus customer stops a bus on the street and refuses to let it move, and then starts tearing it apart, apparently angry that the bus wouldn't stop for him. He claims he chased it for 20-plus blocks. "You piece of s---t, I bang on your f--ing door, you made me chase you from 23rd Street, motherf---er," he screamed. "This is Houston! I chased you 23 f---ing blocks and you wouldn't f---ing stop! F--k you, you piece of s--t."
The bus driver stayed inside as the electronic sign on the bus flashed, "Emergency, call police." Glass could be heard breaking as the man continued to tear apart the bus. An MTA official said the man ended up cracking both mirrors, breaking both windshield wipers and shattering the glass on several doors. The bus operator called for help during the attack but the man fled before police arrived. Three people were on board the bus at the time but no one was hurt. They were put on another bus to continue their trip while the bus operator waited for police to arrive. Incredibly, the man was also seen attacking other MTA buses in the area around the same time, stopping one bus after another as he unleashed his fury. A video obtained exclusively by News 4 shows the man standing in the middle of the street by Houston and Allen as another articulated bus approaches, shouting, "Pull the f--- over, right f---ing now!" As the bus stopped, the man circled it, ranting, "You f---ing kidding, g--damn MTA? This keeps on f---ing happening. It's not OK. All this g--damn running to have f--ing terrible service. F--- you. F--- you. When I want to f---ing go home, you f---ing stop. F--- you. If they don't give a f---, then I don't give a f---." 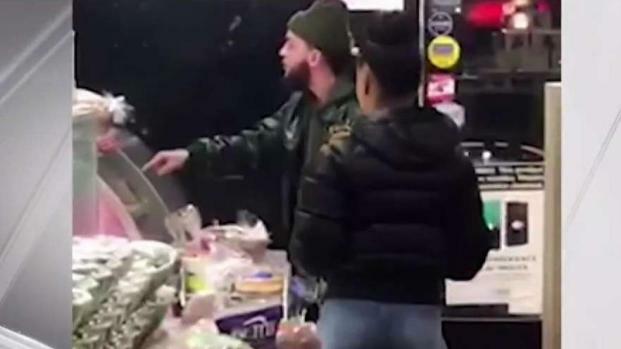 An irate deli customer is wanted for his violent tantrum in which he attacked a worker when he was told his wait time for a breakfast sandwich. Checkey Beckford reports. That bus took off, and the man waved down a second bus behind it, appearing to direct it over to the side. "Nope, right over there," he pointed. "Let's go, right f---ing now. You're not gonna run me the f--- over. I will f--- your bus up like I did everybody else." The man walked up to the driver's side and broke off his mirror, video shows. "And just like everybody else, your bus is out of commission now," he declared. "Right? F--- you. F--- you." The MTA says the bus has cameras, and they're working with NYPD in the investigation. "We do not tolerate any behavior that threatens the safety and security of our employees and customers," NYC Transit President Andy Byford said. "We take this matter very seriously and are working with NYPD to find this individual and bring him to justice."